Zero Point Software today released its second co-operative campaign map. 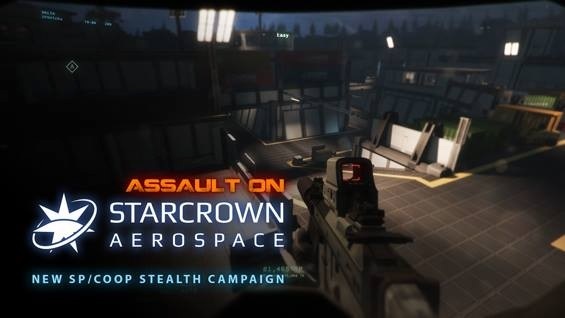 Using stealth gameplay and facing an unscripted AI, players need to infiltrate the heavily defended Starcrown Aerospace industrial-military base to retrieve vital research data. “Our first co-op campaign map propelled players into the Interstellar Marines universe”, said Kim Haar Jørgensen, Creative Director of Interstellar Marines. “We want the Assault on Starcrown Aerospace mission to expand on that, grabbing players’ interest and immersing them ever more in their role as an Interstellar Marine. “Starcrown is all about stealth – using your brain, not just your trigger finger – to secretly and surgically infiltrate an industrial research base. As an Interstellar Marine you do not know what the research is you’re after, but I can tell you it has profound implications for co-op missions we will release in the future”. Starcrown is the second campaign map Zero Point Software has released for Interstellar Marines. They have also released five additional challenge-style co-op maps where players can team up with their friends to take on the unscripted AI in various game modes. You along with a handful of cloned residents of Hover City must work together with a hidden gamer group to overthrow a tyrannical dictator.